Fast and easy method for attaching accessories such as lights, microphones, monitors, or any other gear that has a 1/4” or 3/8” threaded hole to a camera cage, cheese plate or the top of our DXA-MICRO PRO adapter. Top and bottom pieces slide together with a snap to lock. A press of the release pin unlocks the two parts. No need to worry about flimsy style mounts with locking rings that are always coming loose, no matter hard or often you try tightening them. The V-CLIK securely attaches your accessories with a simple snap. This gives you a rock-solid mount and consistent alignment every time. You also have the option of using two screws on the adjoining pieces for an even more secure mount which will never slip out of position. Base and top plate have two captive 1/4” screws which are removable. Precision machined aluminum with a simple design that has only 5 parts. Includes 3/8” to 1/4” bushing which is ideal for mounting microphones. Attach the base piece from the underside via the two threaded 1/4” holes. 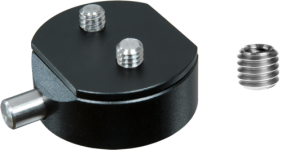 Ideal for attaching to devices that have a 1/4″ mounting bolt such as tripods. This image shows the base attached to the top of our DXA-MICRO PRO+ adapter without the cheese plate. Attach the base piece with two 1/4” screws from the top to any cheese plate or camera rig. The two holes are spaced apart 18mm to fit the standard spacing increments of 9mm for 1/4-20 holes on RED gear and some other manufacturers. This image shows the base attached to our DXA-MICRO PRO+ with the cheese plate.